Brian Sandoval was on the White House’s shortlist to nominate him to the Supreme Court to fill the seat left vacant by the late Antonin Scalia, according to two unnamed sources cited by the Washington Post. But the the GOP governor announced n Thursday that he doesn't want it. “Earlier today I notified the White House that I do not wish to be considered at this time for possible nomination to the Supreme Court of the United States,” Sandoval said in a statement, according to ABC News. Could have to take the leap of nominating him, probably the only chance he’ll get to nominate a Supreme Court Justice before he leaves office. Before Sandoval rejected the offer, we wrote about 5 reasons why Obama should have nominated him to the Supreme Court. 1) Historic: Sure, there’s a Boriqua on the bench -- which is awesome -- but Brian Sandoval would be the first Mexican-American on the bench. That would a be a benchmark -- pun intended -- for one of America’s largest and most discriminated against ethnic groups. 2) Qualified: Brian Sandoval is a former federal judge. He comes highly recommended from Obama’s inner circle. Democratic Sen. Majority leader Harry Reid told reporters on Wednesday that he would be a good pick. 3) REPUBLICAN: The most important reason why Obama should nominate Sandoval is because he is a Republican, an offer that Republicans might not be able to refuse. Right now, Republican senators are vowing to block even a hearing for a potential Obama confirmation. By putting forward a candidate like Sandoval, he’ll make them look ridiculous if they refuse to confirm him, let alone deny him a review. 4) He’ll say ‘yes’: According to two anonymous NBC sources, Sandoval is not objecting to the process going forward. He certainly hasn’t made any public statements saying that he would not accept an offer from Obama. As we reported yesterday, Sandoval denied rumors that he was being considered on Tuesday. His staff repeated those denials again today. 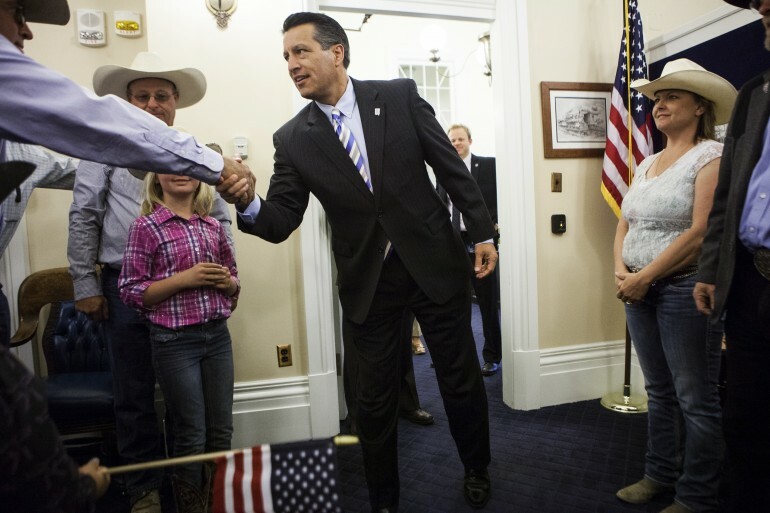 5) He supports abortion rights and immigration reform : Sandoval is a fiscal conservative. He’s not big on unions. There are other issues that Democrats will have with his political beliefs. But when it comes to things like abortion and federal immigration law, Obama won’t be giving up influence on the future of the court.